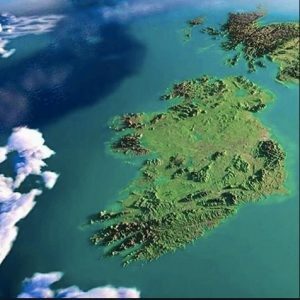 The government of the Republic of Ireland has launched a consultation process allowing its citizens to weigh in on what Ireland will, or should, look like in 2040. An initial step is the publication of the government’s Ireland 2040 Our Plan: National Planning Framework: Issues and Choices (February 2017) (NPF). The current planning effort for Ireland needs to be seen in light of past efforts, including the National Spatial Strategy (NSS) for 2002-2020, and the National Development Plan. The NSS Strategy stressed development in the regions, and away from Dublin, by proposing areas of sufficient scale and critical mass to be built up through a network of gateways and hubs. The National Development Plan 2000-2006 identified Dublin, Cork, Limerick/Shannon, Galway and Waterford as existing gateways, while the NSS designated four new national level gateways – the towns of Dundalk and Sligo and the linked gateways of Letterkenny/(Derry) and the Midland towns of Athlone/Tullamore/Mullingar. In addition, the NSS identified nine, strategically located, medium-sized “hubs” which would support, and be supported by, the gateways and would link out to wider rural areas. The hubs identified were Cavan, Ennis, Kilkenny, Mallow, Monaghan, Tuam and Wexford, along with the linked hubs of Ballina/Castlebar and Tralee/Killarney, working together to promote regional development in their areas. The NSS also identified an important need to support the role of smaller towns, villages and rural areas at the local level. Subsequently, in the National Development Plan, the Irish government relocated some government offices and agencies to areas outside Dublin. For instance, the EPA ended up in Johnstown Castle Estate, Wexford. By 2013, it became clear that the NSS had failed and it was abandoned. A major structural or political weakness of the NSS was that nobody was left behind or forgotten. Almost every political constituency got a gateway or hub. There just were not enough resources to support economic development everywhere. In a post-mortem on the NSS, Rob Kitchin makes clear that its demise was, in large part, because it was not plan-led development but was based on a familiar “general culture of clientelist, cronyist, localist planning system and an attitude of ‘any development, in any location and at any time’.” Then, of course, all bets and plans were off with the economic crisis of 2008, when survival rather than development became the center of attention. The current NPF document does not set down any actual plans to do anything but rather serves as a way of raising questions about what kinds of planning might make sense given the demographics and economics that will likely prevail in 2040 in Ireland. It estimates certain key conditions that will prevail by 2040, in population, housing and jobs, and invites a national debate about how we can make the place where these people will live and work a viable, sustainable place. In a nutshell, by 2040, there will be more people, many of them older, living in more houses, with fewer people per house, and with more jobs, mostly high-skilled ones. Specifically, it is projected that there will be about ¾ million more people, raising the total population to close to 5.6 million. The number of those over 65 will double to 1 million people. About ½ million more houses will be built and there will be on average only 2 persons per house, in contrast to the current density of 2.7 per house. Around ½ million more people will be at work, primarily in high-skilled jobs. Importantly, the growth in houses and jobs will be concentrated in cities or urban areas. In light of such characteristics of Irish life in 2040, what issues should the public, and professionals, be thinking about during this consultation process. Ireland remains a car-dependent society with over 2/3 of commuters driving to work and 1/10 spending one hour or more commuting. That requires a lot of parking facilities and leads to more urban sprawl. And those cars in congested urban areas will generate tons of toxic fumes. Planning for the protection of the air quality in such congested areas is paramount for 2040. While more people will be living and longer, they will not necessarily be living more healthy lives. Serious health considerations for planning include a growing sedentary life style with increasing rates of obesity, diabetes, heart diseases, and depression. Certainly transport plans that focus less on car-dependency and more on walking and cycling and public transport networks will be important for 2040. Much of the growth will occur in the eastern part of Ireland, namely in Dublin and environs. As it is, the Dublin area dominates Ireland, with 40% of the national population and 49% of the economic output. And “Dublin” influence stretches across the midlands, and south and north of the city. At the same time there has been significant growth in the rural population, but again primarily in areas that are accessible to cities and towns, with declines in less accessible areas. Any improvement in the quality of life for rural Ireland must incorporate wide spread access to broadband and internet services. 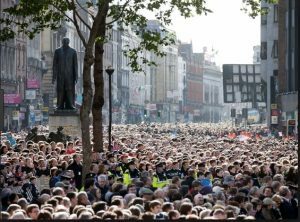 Like every attempt to plan for Ireland there will remain the tension between providing for the bulk of population and economic activity in the large cities, especially along the east of the country, and the preservation of the rural life of Ireland. And the preservation of rural Ireland may need to be disassociated with farming as the continuing consolidation in the Agri-Food industry to larger and larger farms is eliminating more and more small farm holdings, once the backbone of rural Ireland. Other geographic considerations for the NPF are Brexit, or the UK exit from the EU, and the implications for growth and development on cross-border initiatives in the areas of power sources and distribution systems and transport networks, including the Dublin-Belfast railway line. Cross-border concerns for environmental management include water quality, river basins, flood risks, biodiversity and habitats. There seems to be some recognition that the government cannot force, or necessarily entice, people to go where they don’t want to go. Like it or not, much of the increase in population and houses and jobs will be concentrated along the eastern part of the country, in Dublin and environs. Existing plans for diverting drinking water from the Shannon River to the east reaffirms this reality. The NPF does acknowledge that other areas of the country have developed economies and resources that have and can continue to attract specific businesses, and those areas need support in national planning efforts. The pharmaceutical industry in Cork, and higher education and health care in Cork, Galway and Limerick are examples. As Kitchin notes, we can create better places by “selectively prioritizing areas for different kinds of activities in line with its demographics and local resources.” Recognise what you have and where. The danger for the NPF is that the attitudes, primarily in the government and developer circles, have not changed from what prevailed in the failed NSS or in the Celtic Tiger days. In the interview with Oisin Coghlan in the Podcast section of this month’s magazine, he describes that the government has not pursued, and indeed has resisted local government efforts for, more sustainable building codes because the prevailing mantra, with a nod to Sarah Palin, is “Build Baby Build,” with little concern for the environmental consequences. Similarly, Frank McDonald famously described a particular Irish government’s understanding of “sustainable development” as development that must be sustained. Whether these regressive tendencies prevail once again with this new planning strategy remains to be seen. The public’s input, and agitation, are needed to counter these tendencies.